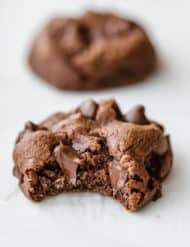 Delicious double chocolate chip cookies... so easy to make and so tasty! In a medium size bowl whisk the flour, cocoa powder, baking powder, baking soda, and salt. Set aside. In the bowl of your stand mixer combine the sugar and cream cheese. Beat on medium speed until creamy, about 2 minutes. Add the egg, oil, and vanilla. Mix until smooth. Add the dry ingredients to the wet ingredients. Mix until combined. Add the chocolate chips and mix. Use a 2 tablespoon cookie scoop and scoop out dough. Place on the cookie sheet leaving about 2 inches between each cookie. Bake for 9-11 minutes or until set. Be careful not to over bake!